Spooky pumpkin faces don’t just belong on your porch this Halloween, you can also create them in the kitchen! We’ve put together a few of our favorite Jack O’Lantern decorating projects and recipes that we’re sure your friends and family will have no problem “Goblin” up. From cakes to cookies and much more, we want to help you make this Halloween one to remember. You can find all the recipes, decorating tips and decorating tools right here for when you get started on your creepy creations. So get creative with these fun Jack O’Lantern recipes from the Wilton team. We guarantee these delicious treats won’t get any “Boos” this Halloween. What isn’t better when it’s miniaturized? 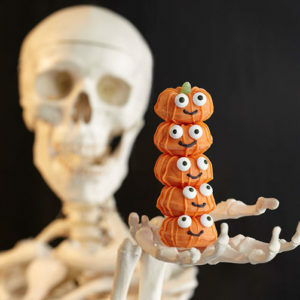 This mini tower of pumpkins are easy to bake and easy to decorate, meaning fun for the whole family this Halloween. Make them as cute, or ghoulish, as you want! Brightly colored and incredibly tasty, this candy-covered Jack O’Lantern is a must have at your Halloween celebration this year. The cake face is easy to create, using the Wilton Jack-O‘-Lantern Pan and candy. Bursting with fright, and goodies, this new cake is sure to delight all of your Halloween guests this year. Not only is it packed with extra goodies, but the candy decorations and bucket are all edible! You can use our Decorator Preferred Fondant to craft the candy into fun trick-or-treat shapes. Choose your favorite emoji, decorate with orange frosting, and you get a recipe that’s both fun and delicious. Perhaps the best project for the kids to do all the decorating, these Pumpkin Emoji Cookies are sure to become a well-loved Halloween tradition. Once your done concocting your devilish delights, send us a snapshot, and don’t forget to follow us on Instagram @wiltoncakes.